If you’d like something to remember from your May holidays, here’s the deal. 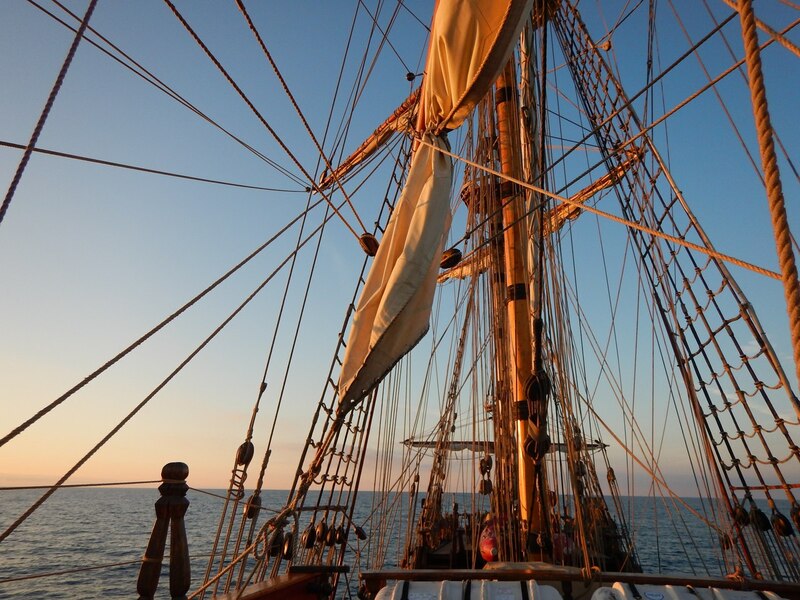 Let us help you spend them in a very special way: in the open seas, by the helm of the wooden 18th century frigate. We’re going to have a breathtakingly beautiful leg from Spanish Málaga through the Gibraltar Strait to the Portuguese port of Cascais not far from Lisbon. We might stop by a few places along the way, such as Gibraltar or Portimão or at the roadstead of one of the friendly Portuguese villages. The Strait of Gibraltar became one of our favorite routes. 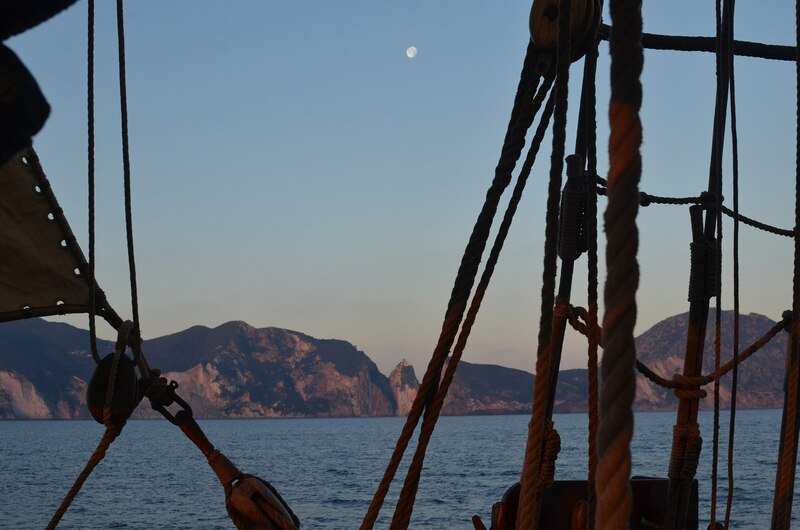 Through the Pillars of Hercules, the ancient sea gateway where Odysseus travelled back in the day, to the Atlantic where the swell is bigger than in the inner seas, the winds are stronger and quiet Mediterranean watches turn into active sail handling and Captain’s orders: “All hands on deck!”. Even if the wind dies out, we won’t be bored. 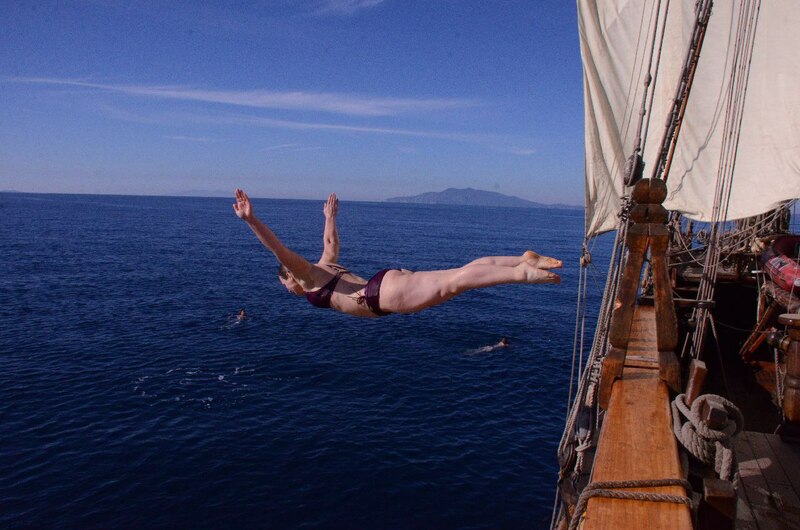 We’ll be diving off the deck, opening the swimming season together. Throughout the centuries the Strait of Gibraltar has very rarely been calm. After Moors have been banished from the Iberian Peninsula, the Strait separating Christian Spain from Muslim Northern Africa would quite often mean to a seafarer an encounter with the Berber pirates. In 18th century among the struggles for Spanish heritage the Gibraltar fortress had seen numerous raging battles. After the Suez Canal was built the Strait of Gibraltar was flooded with merchant ships taking the shortest route from the Atlantic to the Indian Ocean. Retracing the medieval route like a time-machine Shtandart would take us to the times when sailors could only rely on the following winds and use the stars to find their location rather than modern devices with a built-in GPS. This leg is a great chance to dive into celestial navigation. Under the watch officers’ guidance we’ll grab the braces, climb to the mastheads, and test our astronomical knowledge on the night watches using stars – brighter than ever - to plot our course. At the end of this trip the sunny port of Cascais will welcome the weary sailors. Once ashore, don’t rush to the bus that’ll take you to the capital. Cascais, albeit small, deserves your undivided attention. In the city center you’ll find the most beautiful Palácio dos Condes de Castro Guimarães and very unusual Neolithic grottos. West of the city there is the Boca do Inferno (the Hell’s Mouth) chasm that got its’ name for its’ scary appearance.